HIGH STANDING VILLA WITH SWIMMING POOL, GARDEN AND WIFI. Property 19: HIGH STANDING VILLA WITH SWIMMING POOL, GARDEN AND WIFI. Villa to rent 29 Apple Gardens, Rue de Fes, Marrakech. 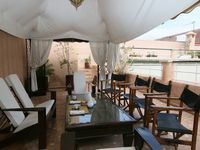 Property 21: Villa to rent 29 Apple Gardens, Rue de Fes, Marrakech. Large villa on 5000 m2, swimming pool - Near golf / sea, Essaouira -Morocco. Property 30: Large villa on 5000 m2, swimming pool - Near golf / sea, Essaouira -Morocco. Azir home. Located in the foot hill of the Seksawa tribe mountains. Property 31: Azir home. Located in the foot hill of the Seksawa tribe mountains. Property 39: Traditional house of charm any comfort with swimming pool without vis-à-vis. Villa Marrakech for 10 people with large pool, stove and internet. Property 43: Villa Marrakech for 10 people with large pool, stove and internet. My wife and I use VBRO often, and in this case, we found an outstanding, welcoming and relaxing ryad. After walking thru the crazy and vibrant medina, we were delighted to find such an oasis in the middle of Marrakech. We were very well looked after, with daily breakfast, olives in the afternoon, in a peaceful location. We needed to use the AC during the warmer nights, which worked well. We highly recommend this ryad to anyone traveling thru Marrakech who wants to be in the middle of the action (the medina is less than 100 feet away) but who wants world class accommodation in a peaceful oasis. Cette villa est juste exceptionnelle. Le cadre est magnifique. Le propri&eacute;taire est tr&egrave;s gentil et &agrave; l'&eacute;coute. Sa personne de contact Touria a &eacute;t&eacute; tr&egrave;s aimable et nous a fourni tout ce qu'il nous fallait. Je vous recommande cette villa si vous d&eacute;sirez passer un excellent moment &agrave; Marrakech.